I love to share a little love with fellow indie writers by posting reviews. 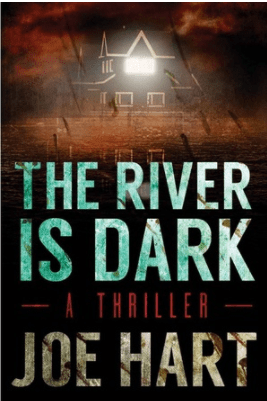 Today, I’m reviewing The River is Dark, but Joe Hart. Published back in 2013, this book is the first in a 2-part series featuring Liam Dempsey. The sequel is called The Night is Deep. More recently, Mr. Hart finished a trilogy in his more usual genres — science fiction and horror. Hart is a prolific writing, listing 18 books on his website all published between 2011 and 2017, an average of 3 books a year. He’s a full-time writer. According to his bio, he’s from Minnesota, where a number of his books are set. His picture shows a youngish guy who, he claims, started writing at 9. I find that impressive since I didn’t start writing until I was about 12, then took a nice long break until my 50’s. As you know, I like to share the good, the bad, and the ugly when I do a review. Hopefully, the writer learns something and improves their writing and aspiring writers learn not to make the same mistakes or to copy successful elements from other writers. I found the book enjoyable and the action flowed nicely. It got a little slow in some parts, but that’s mainly because I was so engrossed I couldn’t wait to read what was going to happen next. The action kept coming and he kept you in the dark until the very end. I like that in a novel, where I’m following clues along with the detectives to help solve the crime. I found his characters interesting. Liam is a former police detective and I won’t spoil the story by telling you about the “former” part. He’s a pretty likable guy and I feel like he had some depth to him, although his backstory is a little weak. I guess I would have liked to know how he supports himself now that he’s not a detective and how he got where he is, but I can live without that. Liam’s brother and sister-in-law are brutally murdered so he returns to a town he hasn’t visited to bury a brother he didn’t love. He soon discovers that another couple was murdered the week before and their young son is in the hospital, unconscious. He resolves to find out how his brother is linked to the couple, which leads to a series of events that nearly kills him. His love interest is Deni, his sister-in-law’s cousin who he fell for at his brother’s wedding 10 years ago. She agrees to help both plan the funerals and solve the murders, which nearly kills her, as well. OK, I would still recommend the book, but I think it could use some improvements. First, the writing distracts from the story in places. There are some mistakes, but, heck, we see mistakes in traditionally published books and I’m always a little disconcerted to find them in my own published works. Worse than the mistakes are places where Hart attempts to flower-up the writing and uses the wrong word either because he doesn’t know its real meaning or just make a poor word choice. Either way, it’s disconcerting. Sometimes his attempt at making his writing more literary interfere with the story and other times they’re too obviously typical. Next, he has some plot problems. Sometimes Liam seems really smart and skilled, other times he just doesn’t. For instance, he’s hyper-observant and intuitive, but misses repeat appearances of the killer covered with a hood in the heat of summer. Or he does something that doesn’t seem realistic. For instance, he’s hit in the back with the murder weapon causing a lot of damage, then the next day acts like nothing happened. His supporting cast gets almost no air time. It’s mostly the Liam and Dani show, with cameos by the Sheriff and Nut. Even one of the victims gets less than a page to build his character. The murders are very gruesome and get graphic coverage in the book. Some things need to be left to the imagination.